The new owner of a troubled heritage steam railway in County Durham has revealed expansion plans to boost passenger and freight traffic. Iowa Pacific Holdings, which operates 700 miles of track in the USA, has taken a 75% stake in Weardale Railway. The volunteer-run railway has struggled to break even since coming out of bankruptcy two years ago. The new company plans to reinstate all of the railway's 18 miles of track and boost services by the end of 2009. 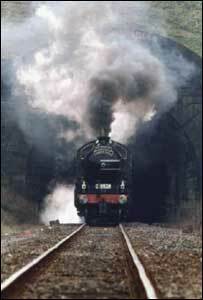 Trains currently run on just five miles of the line between Wolsingham and Stanhope. But Ed Ellis, president of Iowa Pacific Holdings, promised an ambitious revamp, with a link to East Coast Main Line services and a new freight handling facility. He said the plans would boost the area's economy and tourism. Mr Ellis said he believed UK railways were "in for a revival". He said: "There is going to be a doubling of freight handling on the railways here in the next 30 years and more passenger traffic. "We are looking to establish a freight terminal that would handle mineral, food and agricultural commodities. "It will be great also if people in the Wear Valley can get the train and connect in Darlington with the national network." Mr Ellis said discussions were ongoing with Network Rail about the planned freight facility and a new platform for Bishop Auckland station.